What is a dietary need? 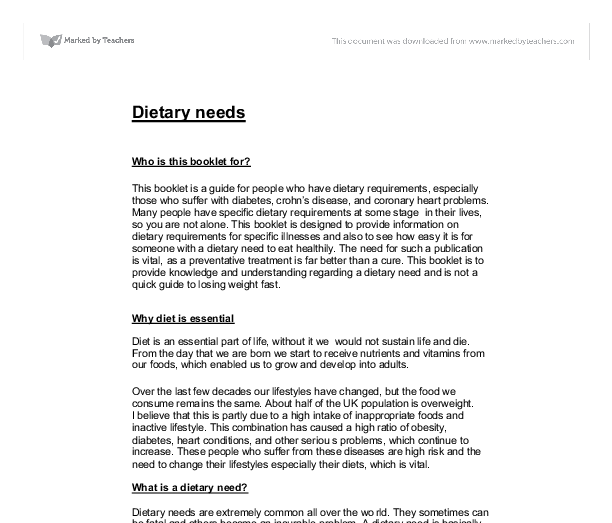 Dietary needs Who is this booklet for? 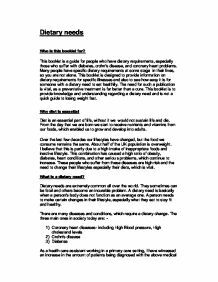 This booklet is a guide for people who have dietary requirements, especially those who suffer with diabetes, crohn's disease, and coronary heart problems. Many people have specific dietary requirements at some stage in their lives, so you are not alone. This booklet is designed to provide information on dietary requirements for specific illnesses and also to see how easy it is for someone with a dietary need to eat healthily. The need for such a publication is vital, as a preventative treatment is far better than a cure. This booklet is to provide knowledge and understanding regarding a dietary need and is not a quick guide to losing weight fast. Why diet is essential Diet is an essential part of life, without it we would not sustain life and die. From the day that we are born we start to receive nutrients and vitamins from our foods, which enabled us to grow and develop into adults. Over the last few decades our lifestyles have changed, but the food we consume remains the same. About half of the UK population is overweight. I believe that this is partly due to a high intake of inappropriate foods and inactive lifestyle. This combination has caused a high ratio of obesity, diabetes, heart conditions, and other serious problems, which continue to increase. These people who suffer from these diseases are high risk and the need to change their lifestyles especially their diets, which is vital. What is a dietary need? Dietary needs are extremely common all over the world. They sometimes can be fatal and others become an incurable problem. A dietary need is basically when a person's body does not function as an average one. A person needs to make certain changes in their lifestyle, especially what they eat to stay fit and healthy. There are many diseases and conditions, which require a dietary change. ...read more. In supermarkets and shops there is a wide variety of foods and drinks. Ready made meals have revolutionised our lives, providing quicker and convenient meals, which fit into our busy lifestyles. However some of these dishes are higher in fat and are more expensive than foods prepared at home. Accessibility and availability has never been easier, products, which were once seasonal, can now be bought throughout the year. DIABETIC DIET = HEALTHY DIET The modern diet for diabetes is the one, which is recommended as the healthy option for the general population. It is not unduly restrictive, complicated, or special in any way. It is no longer necessary to stigmatise a person with diabetes by recommending they eat differently from family and friends. Instead the whole family can be encouraged to eat a more balanced diet and reap the health benefits. One of the main features of this booklet is to understand what diabetics are faced with whilst trying to adapt to a new more beneficial lifestyle. A survey was conducted on the following supermarkets and shops to see how easy it is for a diabetic person to eat appropriately. Before this specific investigation was performed, advice was sought from a qualified dietician regarding what foods to buy and what not too buy. The 6 steps to eating a healthy diet * Eat regular meals based on starchy foods such as bread, chapattis, potatoes, rice, and cereals. Wherever possible, choose high fibre varieties of these foods, like wholemeal breads and wholemeal pasta. * Try to cut down on the amount of fat in the diet, particularly saturated animal fats, as this type is linked to a number of health diseases. Eating less fat and fatty foods will in turn help you lose weight. Use less butter, margarine, cheese, and fatty meats. Try to grill, steam or oven bake instead of frying or cooking with other oils. ...read more. The most important nutrient to look out for is FAT. For foods you eat in large amounts, like ready meals, look at the amount per serving. For snacks and other foods you eat in smaller amounts, look at the "per 100g." Are special diabetic products necessary? Whilst shopping in the supermarkets, I observed that there were no actual foods specifically for diabetics, and I became curious why this was. A statement made by Diabetes UK states that they do not recommend the use of so called "Diabetic Products." Diabetic foods had there hey day in the 1960s when the focus of dietary education was on sugar free, low carbohydrates diets. These products had nutritive sweetening agents that behaved as sugars, food manufactures jumped on the band- wagon when they saw that there was such an obvious market to exploit. Now these products are non- existent within supermarkets. In their place there is a large range of various low fat products. Some other useful tips for diabetics 1) Regular meals and snacks Eating little and often- improves diabetic control as well as cholesterol levels. Changing the way you eat also gives you more control of what you eat as well as preventing both starvation and overindulgence, which is bad for anyone with a dietary need. Diet plays a huge part in controlling your diabetes. It is therefore important to be sensible and follow recommended guidelines for maintaining a healthy diet. 2) Limit Alcohol Drink in moderation ONLY. Avoid sweet wines, liquors and Sherries as well as strong beer and lager. Never drink on an empty stomach as it can cause your Blood sugar to drop too low. Remember, alcohol also contains a lot of calories. 3) Watch your Weight Being overweight does affect your diabetes and losing pounds sensibly will help you control it. According to diabetes UK over 80% of people with type II are overweight when first diagnosed with diabetes and obesity is the main factor to the rapidly increasing number of people with type II diabetes. ...read more. * Low fat and low-calorie only account for a small percentage of new product developments. Most of these types are within existing well-known brands such as Weight Watchers from Heinz. * New product developments are likely to focus on healthiness, although not necessarily low-fat/low-calorie. Swelling may also occur in the system. The skin: in the process of temperature regulation, sweat glands secrete salt and water on to the surface of the skin. In doing so, the skin helps regulate electrolyte balance and the removal of excess water form the system. will add to the children's 5-a-day, the fruit juice will give it a sweet taste which the children will enjoy, and also they will be attracted by the different colours of the fruits. enhances the absorption of iron. In contrast, tannins found in tea reduce the absorption of iron. Eat iron rich and vitamin C rich foods together, e.g., choose a glass of fruit juice with a bowl of breakfast cereal rather than a cup of tea.